Welcome to Day 21 of the 31 Days of Halloween! This is an annual Smeared Ink event and we are so thrilled to be playing along as Wicked Bloggers. The Wicked Blogger challenge is to post a new creation each day during October that contains a stamped image, digi or rubber! Check out all the rules and prize details at Smeared Ink. I made the background by swiping several Distress Inks on the mixed media paper. I let it dry them sprinkled and misted with water to blend them a bit. Once dry again, I misted with DecoArt Mister Shimmer White and some splatters of the same. This helped to tone it down in spots and make it blend more. The balloon stamp is Hampton Art. I wanted a creepier version so I added my skull stamp given to me by the fabulous CT Granne. The skull is made by Finnstamper. This was the same stamp used on our CT postcard swap, I love it! Both images are heat embossed in black and colored with Distress Inks. Remember to come back and link up your weirdly odd and creepy makes with us in our challenge! Love the mistical background, skellie on the ballon works! Awesome space background and just love what a perfect match the sentiment and the image is. Brilliant Kim! Oooo I just love this freatastic altered canvas postcard, love that skellie hot air balloon! Fangtastic project Kim! 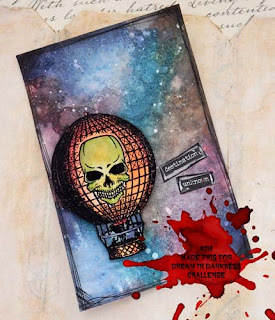 Love the juxtaposition of the balloon stamp and the skull stamp--what a great idea! Background is great as well. The skull in the balloon is great. Fabulous background! 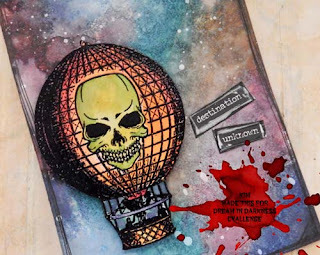 Love the skull superimposed on the balloon...great job! oh loving that skull balloon and the background is awesome. May not want to know the destination anyway right? ONE SCARY HOT AIR BALLOON.... love the effect you created on your background ... sure looks like a spooky sky. Thanks for sharing!